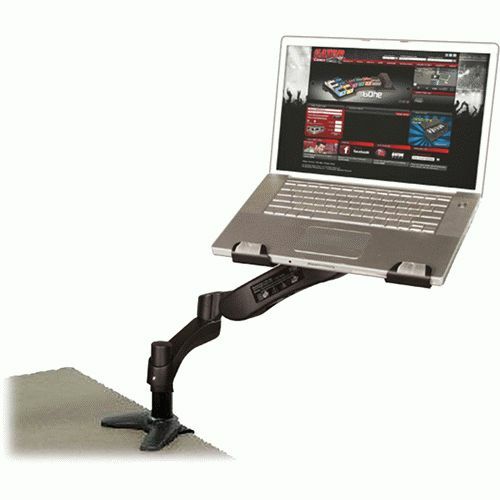 New fully rotational ARM from Gator Cases allows secure mounting of laptops, tablets and LCD screens with VESA mount. Adjustable ARM provides 360-degree horizontal movement and 90-degree vertical adjustment with ease. Versatile mounting tray includes padded clamp brackets and no-slip rubber pad to secure equipment and prevent slippage. Integrated cable management keeps cables tidy and out of the way. The G-ARM-360-DESKMT is a great addition to any studio, with a heavy duty clamp bracket allowing setup on virtually any flat surface such as tables, desktops and even audio racks. The ARM adds a new level of flexibility for video production and sound engineering. Gator's new ARM 360 lets you decide your ideal setup and with a simple push can quickly be moved aside when not in use.